A reader thinks he's overlooked a feature. In fact, the feature is missing! One thing which is now bugging me is the apparent inability to sort the contents of the launchpad into some sort of order…the newest items are on the final page. I know I can drag individual items to different pages and sort them manually, but with four pages, it takes some time. It’s not you; it’s Apple. Launchpad is another slightly neglected OS X feature that made improvements and then stalled, making it less than useful to many people. Because I have so many apps installed, I have seven Launchpad screens and face the same problem. Now, with Launchpad active, you can just start typing—you don’t even need to move the cursor into the search field—and the app shows matching items, which you can mouse or arrow through to select and run. Launchpad Manager extends and modifies Apple’s limited options for its app springboard. You manipulate items in its interface, and changes appear in Launchpad. You might also consider Launchpad Manager, software that radically simplifies and extends Launchpad. 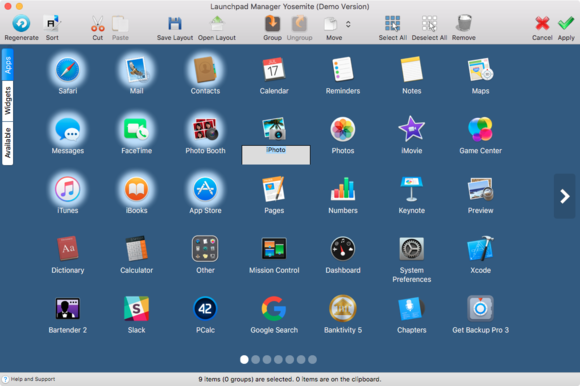 A free version includes several features, like drag-and-drop re-ordering, renaming icons and groups within Launchpad, and removing items and groups from Launchpad. For $8, you can load custom layouts, alphabetize apps, and better manage multiple selections and grouping. The latest version is compatible with Yosemite and El Capitan.